Going to a music festival is never as simple as just buying a ticket and showing up. You need to figure out how to get there, what food you want to eat, and what performances you absolutely (seriously, this is why you bought a ticket in the first place) can’t miss. And that’s just the beginning. 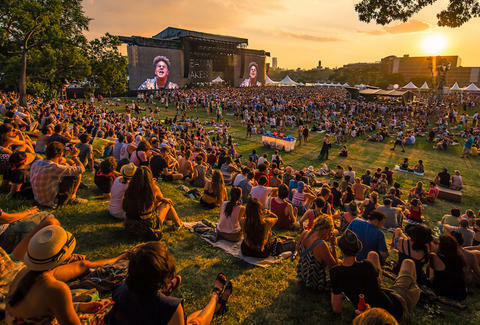 New York City has its share of formidable festivals -- including Panorama, which hits Randall’s Island this season from July 28-30. Entering just its second year, the music and arts bash was started by the same folks who produce Coachella and is already one of the city’s most highly-anticipated summer events. Since we know how much planning it takes to attend a festival, we broke it down for you. Here’s everything you need to know about attending Panorama, from who to see, where to eat, and the best hotels to book. Some things you will want to bring are a refillable water bottle, lots of sunscreen (lotion only), a battery pack for your phone, and a blanket or towel for that much-needed rest. If you’re coming in from out of town, you may also want to snag a paper map of NYC -- that way you can find your way home even if your phone dies from posting Instagram Stories all day. Like many festivals these days, paper tickets are out and RFID (radio-frequency identification) wristbands are in. Shipped to you in advance, the wristbands grant you entry to Panorama, and must be activated online prior to the event. If you don’t complete registration beforehand, lost wristbands can’t be returned and broken ones can’t be repaired. Something to keep in mind: there’s no re-entry at Panorama, and wristbands only allow you to enter the venue once a day. Randall’s Island is located in the East River between Manhattan, Queens, and the Bronx, and since we don’t recommend swimming, here are all the other ways to get there. To get there by train, take the 4, 5, or 6 line to 125th street. From there, catch the X80 express bus that drops off right on the island. Or if you’re counting steps, simply walk from 125th and cross the RFK Bridge. It’s about a mile-long journey from the subway to the festival, and you’ll likely be walking with a huge crowd of like-minded party-goers. Panorama also offers shuttle bus and ferry packages, but you’ll need to purchase special tickets in advance. Over the course of the weekend, ferries will depart every 15 minutes (beginning at 11am) from Manhattan (East 35th Street and FDR Drive) to Randall’s Island. Though ferries will stop taking people to the festival at 9pm, they’ll keep running back to Manhattan until everyone has left the island safely. There will also be shuttle buses from Williamsburg, Brooklyn directly to Panorama. These will depart from the corner of Union and Meeker Aves. from 11am to 6pm. Shuttle buses back to Brooklyn will start at 8pm and will run until everyone is off Randall’s Island and eating pizza at their favorite late-night spots. Keep in mind: There is no car parking on the island, so driving there isn’t recommended unless you’re being dropped off. Panorama organizers actually do recommend biking to the festival, and there will be an entire lot of racks on the island to secure your bike. (Be sure to bring a lock!) Note that this lot won’t accommodate motorcycles. A huge part of any festival is having some of the city’s best food all in one place. The 2017 vendors haven’t been announced yet, but if last year’s selection is any indication, they’re gonna be freakin’ epic. With NYC vendors like The Beatrice Inn, Oddfellows Ice Cream, Nix, and Dough (to name a few), Panorama makes for a legit rival with the city’s most popular food fairs. In 2016, Bushwick pizza joint Roberta’s offered up their famous pies for festival-goers. Aside from just the margherita, there were specialties like the Bee Sting, topped with chili flakes, mozzarella, soppressata picante, chili oil, and honey. Knowing that some of the biggest acts in music will be at Panorama (we’re talking Tyler the Creator, Nine Inch Nails, A Tribe Called Quest, Spoon…), make sure to plan accordingly. Everyone will be talking about these performances. Little sister Solange is giving Beyoncé a serious run for her money. After live-staging her album, A Seat at the Table, at The Guggenheim this past May, the performer is hitting the festival circuit. Known for combining her music with visual art, she’s sure to pull out all the stops as a Panorama headliner. This June, Frank Ocean made his long-awaited return to the stage, performing at Denmark’s Northside Festival for the first time since 2015. Panorama will mark his return to New York City, and after such a long hiatus, his Friday night show will have everyone talking. British indie band Alt-J are on the road promoting their brand new album Relaxer -- their first record in three years. Fans have been patiently waiting for new music (and for the band to return stateside). If you haven’t heard the new songs, check out their recent performance on Conan to get a preview of what’s getting people buzzing. Though the big-name artists are always a priority, don’t sleep on the up-and-comers. At Panorama, don’t miss Chicago rapper/poet Noname, who’s known for her work with Chance the Rapper and whose 2016 debut mixtape, Telefone, received rave reviews. Then there’s British electronic producer Mura Masa whose recent collaborations with Desiigner and A$AP Rocky have made him hugely popular across the U.S.
A big part of what makes Panorama distinct is its extension beyond just music. In collaboration with local NYC-based artists, organizers formed The Lab, an interactive, immersive exhibit. Featuring works that combine technology and art, The Lab plays with all your senses to create a surreal experience for attendees. Heartfelt by Ekene Ijeoma is an installation in which participants hold hands and let electricity flow through them to turn on lights and play sounds. It all sounds pretty trippy, and surely more memorable than another Boomerang or tweet. Smack dab in the middle of the festival will be an open-air dance club called The Point, which will play continuous house and techno all day and night. Most importantly, it’ll be shaded and misted. In addition to providing relief from the heat and a fun place to show off your moves, the club will aim to honor New York City’s role in DJ culture and electronic music. But to reiterate: It will be shaded. And misted. If you’re visiting from out of town, make sure to take advantage of everything the city has to offer. No rookie mistakes here. July is an insanely busy travel month for NYC, so if you’re visiting town for the festival, make sure to book a hotel stat. Because the festival will be most easily accessed by the 4, 5, or 6 trains, staying on the east side of Manhattan near one of those subway stops will help keep your commute to Randall’s Island as easy as possible. You can also book a place in Williamsburg and opt in for the Panorama Festival shuttle from the Brooklyn neighborhood. Club Quarters Hotel is located right by Grand Central Station, leaving you just three subway stops from 125th street, which gets you close to Randall’s Island. However, if you plan on hitting the town, the Orchard Street Hotel is surrounded by countless restaurants and cool bars in the happening Lower East Side neighborhood. Farther uptown is The Franklin Hotel, a small, clean little spot that’s only one train stop to 125th, a short walk to Central Park, and has lots of places to shop nearby. To prevent burnout, you’ll need to fuel up big time before you head to Randall’s Island each day. To get your caffeine kick, hit up La Colombe, a chain around the city that definitely won’t disappoint. Locals flock to their locations for draft lattes (which you can also grab in a can if you’ve got a ferry to catch). If you’re taking the Williamsburg shuttle, check out Gimme Coffee, just a couple of blocks from the pick-up point. This New York-based chain is renowned for its unreasonably delicious espresso and small-batch roasted coffee beans. Of course, you can’t go wrong with Black Seed Bagels. This wildly popular spot (with a few locations in downtown Manhattan) changed the game when they combined New York-style bagels with wood-fired Montreal-style bagels. The options are endless... but you can never go wrong with bacon. Then if you’ve got a sweet tooth, don’t miss Dun-Well Donuts in the East Village or Williamsburg, where the creations just happen to be vegan. Seriously, these donuts are so divine you won’t be able to tell. If you were too distracted by the music to take advantage of all the festival’s vendors, fear not: It is New York City, after all. Plenty of places will still be serving food by the time you make it off Randall’s Island. Ukranian diner Veselka in the East Village is open 24 hours/day, serving pierogi, kielbasa sausage, and other rich Ukrainian comfort food at all hours of the night. The Meatball Shop has multiple locations both uptown and downtown and stays open until 2am. True to its name, the menu focuses on meatballs, but includes vegetarian options and an impressive cocktail list. If you’re starving and want a super quick bite, stop by the 2 Bros Pizza shop right by the 125th street station on your way back from Randall’s Island. 2 Bros is a no-frills chain that New York City locals love because it serves plain cheese slices for just $1 flat. If you still somehow have energy after a full day of dancing, well, color us impressed. There’s nothing better than NYC’s rooftops in the summer. After the sun sets and the weather cools down, rooftop bars expose the city’s best views. In Manhattan, Hotel Chantelle in the Lower East Side is always a great choice, while in Williamsburg, Night of Joy serves up fresh frozen margaritas on its roof patio and Berry Park has a crazy impressive selection of European beers and tons of outdoor space. There’s no better time to be in New York than July, and there’s a lot going on in addition to Panorama. Head over to Central Park and see a rendition of A Midsummer Night’s Dream performed outside by Shakespeare in the Park. Panorama also overlaps with NYC Restaurant Week, aka Christmas in July for foodies. Over the course of a few weeks, tons of restaurants around the city offer discounted prix fixe meals which can be a perfect opportunity to try a place you’ve been meaning to check out or that might typically be out of your price range. The only hitch is you have to reserve your spot in advance. This year, reservations open July 10. Also be sure to see some off-the-beaten path destinations around the city. Visit the waterfront Carl Schurz Park on the Upper East Side, the hipster New Museum on the Lower East Side, or the ongoing summer food festival known as Madison Square Eats right in front of the Flatiron Building. But at the end of the very long day or festival weekend, just remember to make the most of it. And try to get a selfie with Solange.